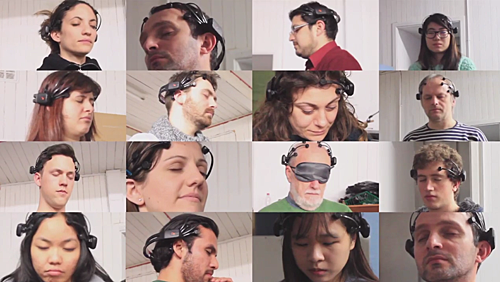 People have tried EEG on pumpkins, melons and dead fish. There’s no real evidence that it works on dogs, but it was worth a try. The dominant reading for Jasmine was excitement. This blog post is co-written with PhD student Dorothea Kalogianni. Electroencephalography (EEG) is a fascinating technology that measures the intensities of the key frequencies at which the human neural system propagates electrochemical signals. 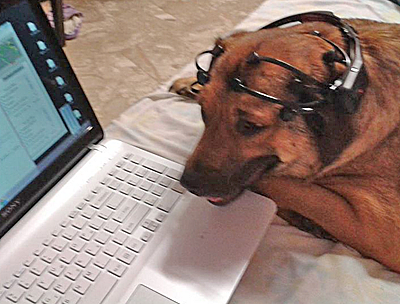 Head-worn EEG devices are relatively inexpensive, and are now used in all kinds of test environments to record how people feel while watching movies, play computer games, and make consumer choices. Brainwave intensities seem to correlate with a person’s general affective state, i.e. their emotion or mood. We are using an EEG headset as supplied by Emotiv. Emotiv also provide software that filters and processes these wave intensities to indicate how engaged the wearer is in some stimulus. Low engagement also means a high level of boredom. The device also picks up on whether the wearer is in a meditative state, is excited or frustrated. 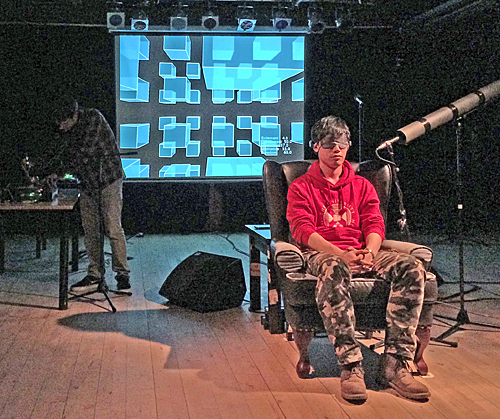 A group of students, known as the Braindrain group, performed at an installation in Edinburgh College of Art’s Wee Red Bar on 29 May 2014, with Alvin, as “brain artist,” rigged with the EEG device and required just to sit for 30 minutes in a comfy chair. Around him were positioned custom-made instruments for generating electro-mechanical sounds. The screen behind Alvin showed a dynamic geometrical image that altered according to his mood state and as picked up by EEG (engagement, meditation, frustration and excitement), while music technologist Robbie operated the instruments. 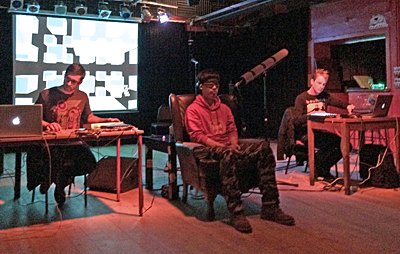 Later on that evening, two laptop performers Dara Etefaghi and Timo Preece composed in real-time an extended sound duet as Alvin’s brain silently performed the role of mood critic. See the note below about Alvin’s emotional response to the different experiences. This event was the culmination of a series of experiments linking brain and performance organised by Dorothea Kalogianni with a team that included Robbie Christie, Qianqian Hu, Zechao (Alvin) Li, Asuka Kanetake, Donghui Xie, Marina Papagianni, and Wolfgang Thomas, students and practitioners of digital media, sound design, acoustics and music technology. Here’s a video explaining the project in more detail. 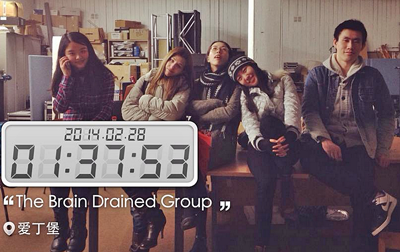 See the Braindrain project website. Also see external sites No more woof, Do plants have feelings? and What a dead fish can teach you about neuroscience and statistics. Also see blog posts tagged Brain. We spoke to Alvin after the Wee Red Bar event. As verified by the EEG display, he was more excited (and frustrated) by Timo and Dara’s performance as it was entirely new to him.